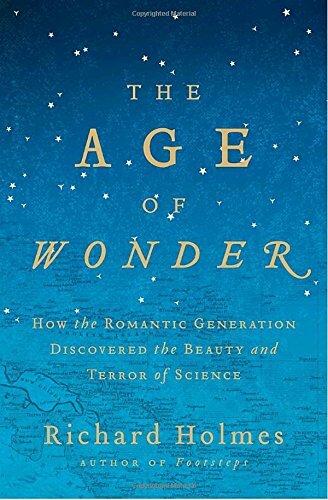 A riveting history of the men and women whose discoveries and inventions at the end of the 18th century gave birth to the Romantic Age of Science, "The Age of Wonder" explores the earliest ideas of deep time and space, and the explorers of "dynamic science": an infinite, mysterious Nature waiting to be discovered. Three lives dominate the book: William Herschel, his sister Caroline, and Humphry Davy. In his radiant new book, "The Age of Wonder," Holmes treats us to the amazing lives of the pioneering sailors and balloonists, astronomers and chemists of the Romantic era. Making good on the book's subtitle, he takes us on a dazzling tour of their chaotic British observatories and fatal explorations in African jungles, showing us "how the Romantic generation discovered the beauty and terror of science." Richard Holmes aims to debunk the popular image ("myth" is his word) that the Romantic era was inherently "anti-scientific." Indeed, he argues, it was an era in which science was remarkably transformed by the spirit of the age. . . . [He] endeavors to dramatize how the "Romantic Generation" -- bracketed by Capt. James Cook's first voyage around the world in 1768 and Darwin's embarkation for the Galapagos Islands in 1831 -- achieved what amounted to a "second scientific revolution" (Coleridge's term), forever altering the course of scientific investigation. . . .
Mr. Holmes perhaps overstates the discontinuity between "Romantic science" and what came before and after, but he is right to stress the novel tone that insinuated itself into the project of science at the end of the 18th century. And he is right to seize the expeditions of discovery as chronological markers. It was a moment in which bold explorations -- cosmological as well as geographical -- changed our understanding of the world. Okay - finished the age of wonder while reading through a fit of insomnia early this morning. Richard Holmes' background is that of a literary historian/critic specializing in the romantic poets in particular. His approach works very well in this biographically grounded history of a distinct period in British cultural history. This age celebrated "the heroic" - whatever the field. And many of the major players, whether in science or literature or the battlefield, accepted this role, some far more avidly than others. Astronomy, chemistry, scientific expedition , and, to a lesser extent, geology and electromagnetism are the featured sciences. The Herschel's astronomical ventures and Lyalls geologic forays into deep space and deep time respectively required educated Britons to rethink their place in the universe. The stories of the great natural history treks both created public heroes and a fascination with the world that seemed stranger than fiction. The British chemists, with Sir Humphrey Davy the lionized public face of British science at the fore, conclusively demonstrated that the "sensible interpretation" of the physical world was wrong. (ie fire was not an element but rather a chemical process). Additionally the chemists proved their social utility by making life safer and more convenient - perhaps the most dramatic example being Davy, with the aid of his assistant Michael Faraday, developing the Davy safety lamp for coal miners, based on his understanding of the principles of combustion, that made an incredibly hazardous occupation significantly safer. British writers and scientists mixed both socially and "philosophically" - with Davy's friendship with the Lake poets being again the leading example. Holmes discusses the odd phenomenon of poets footnoting their verse with scientific asides - a practice begun by Erasmus Darwin, Charles's grandfather, and continued on through Shelley and Queen Mab! Davy wrote verse throughout his life (Southey was his initial poetic mentor) - and there are many examples of his poetry inspired both by nature, science and love. The book closes with Darwin and the Beagle - signifying both a satisfying end to one era and the beginning of another even more contentious, arguably more productive, era in which science became increasingly more specialized and "professionalized." Once upon a time, long, long ago, I was pretty fascinated with science. I thought about being pre-med. I got my highest SAT score in Chemistry. Then I was hit in the face with higher mathematics which made absolutely no sense to me and included intensively long calculations and logarithmic tables and slide rules -- this was a few years before students actually were encouraged, and then required to buy calculators. That was it -- I did my math/science requirements in college by taking botany, psychology and physical science for liberal arts majors. Botany was somewhat interesting, but I could never really see through a microscope; the psychology professor was a sadist who insisted on all kinds of statistical analysis (thank god I had a boyfriend who was a psych major and got me through the labs); and phys sci was a bore. Obviously, I became an English major and never took another science course again. Had there been a course offered in the history of science and had Richard Holmes' splendid book, The Age of Wonder been one of the textbooks, I might have been inspired to complement my literary studies with some scientific studies. Holmes presents the unfolding of the experimental world of applied science in England contemporary with the outpouring of Romantic literature from the 1780s to the 1830s. The Age of Wonder is wonderful cultural history combined with scientific biography. The biographical focuses of the book are William Herschel, the astronomer and microscope builder, who discovered the planet Uranus and the moons of Saturn; Humphrey Davy, whose experiments and discoveries in electricity and chemistry revolutionized the scientific world; and Sir Joseph Banks, who as a young man sailed around the world with Captain Cook, wrote an anthropological study of the Tahitians, and returned to England to become the longtime President of the Royal Society, encouraging and sponsoring a variety of scientific ventures (and literary ones -- he sponsored lecture series by Coleridge). It's an age of the popularization of science with Davy and others giving wildly popular public demonstrations of their experiments and books being written for a general readership and even children about the new scientific principles being discovered. Man flies for the first time in hot air and hydrogen balloons -- the earth is seen from above and meteorology is born. Clouds become the focus for scientists as well as poets. William Herschel's sister Caroline uses her own telescope to discover comets and meteors and is paid by the crown to assist her brother in his sky-sweeping. Earth, air, fire and water are no longer the basic components of the universe -- it is discovered that water is made up of hydrogen and oxygen; air has various elemental gases; the earth is wildly complex, and fire is not an element at all, but a means of transforming one form of matter into another. One of the burning philosophical and scientific issues is the nature of life itself -- can it be captured in some sort of essential form -- what role does electricity play in the vital force of life?? June 24th 1833 was the date when the word 'scientist' was arguably coined. At a meeting for the British Association for the Advancement of Science, William Whewell was addressing the packed Senate House on the nature of science when the applause died down one sole figure remained standing, and to the surprise of everyone present, it was that of the Romantic poet Samuel Taylor Coleridge. He remarked of the members present in the room that the name they used for their profession was no longer appropriate, men knee deep in mud searching for fossils being called 'natural philosophers' didn't quite seem right and the other moniker 'men of science' hardly included the likes of Caroline Herschel; something better had to be devised. As an actual metaphysician himself Coleridge wanted a name that would more reflect the practical and hands-on nature of their work. Whewell's suggestion was that one could by analogy of art to artist go from science to scientist and thus the word was born. This book deals with how we progressed from the pure philosophy of the inductive reasoning of Bacon and Newton and the rationalism and foundationalism of Descartes, through the independently wealthy and crown sponsored men of Royal Society to the more familiar profession of science of Whewhell, Charles Darwin and beyond. At the heart of this book are biographies of three of the guiding lights of Romantic science. The first is of Sir Joseph Banks whose botanical voyages in Tahiti with Captain Cook opened his eyes to a world of experience and adventure which, when he himself was crippled by gout and unable to travel, encouraged in others as the President of the Royal Society. The second is William Herschell and his redoubtable sister Caroline who brought skill, ingenuity and a complete thoroughness to the science of astrology through regular nightly sweeps of the sky and better telescopic technology that helped them discover Uranus and two of its moons as well as two moons of Saturn and a catalogue of over 500 new nebulae. Finally we meet Sir Humphry Davy and his experiments with gases and electricity made him a veritable rock star. Part of what makes this period so exciting is that the arts and sciences had an almost symbiotic existence. Erasmus Darwin and Humpry Davy both composed poetry whilst the likes of Coleridge, Wordsworth and Shelly wrote pamphlets on science and natural philosophy. It was a synthesis that was mutually beneficial which makes me think that Stephen Hawking was all the more wrong when in his most recent book 'The Grand Design' he made the pronouncement that 'philosophy is dead' a somewhat ironically self-defeating philosophical stance. Richard Holmes has written many books about romantic authors and poets. This is a natural extension of his earlier work since many learned men and women of the time had a curiosity about the world and how it worked. The main thrust of the book is the story of the Royal Society in the early 1800s (of which Ben Franklin was a member along many other famous scientists up to this day) and its longtime president, Joseph Banks (1743-1820). Holmes also covers the work of William and Caroline Herschel in astronomy, Humphry Davy and the safety lamp, Mungo Park’s explorations, and a host of supporting characters, including Mary Shelley and Thomas Beddoes. The writing style was informal and interesting, not typical of most scholarly books. Knowledge of science is not necessary to understand the book. The only in-text footnotes are necessary to explain the concepts or expand on the text. The normal footnoted items were listed as references in the back of the book along with an excellent index, a bibliography divided by subject, and a cast list (to easily keep track of all the minor players in the story). The illustrations are in full color and added to the enjoyment of the book. The Age of Wonder covers the period in British science from Captain Cook's voyage around the world with the young Joseph Banks sailing on the Endeavour as the expedition's naturalist up to shortly after an equally young Charles Darwin sailed on the Beagle as that expedition's naturalist. Richard Holmes focuses on a few of the leading figures of the time, including Banks, the Herschels (William and Caroline), Mungo Park, Davy, Mary Shelley (what ideas were current among literary,philosophical, and scientific circles that led to her famous novel? ), Coleridge and his peers, and the next generation of scientists such as Faraday, Babbage, Darwin, and John Herschel along with Mary Somerville as a populariser of science. Although I read this over several months with other reads between sections, in the end, I found it to be a great look at this period in the history of science. At the beginning of Banks career, first as a naturalist and then as the very influential President of the Royal Society, there was not really a separation of the various branches of intellectual life. The Society's lectures were not only attended by observers and experimenters in science but by poets, essayists, and interested members of the general public. Many of the literary figures dabbled in science and many of the scientists wrote poetry. In fact the very word scientist was invented towards the end of this period, being first suggested at an early meeting of the BAAS. This wonderful history offers an account of British science in the Romantic era, told through the lives of three men. Joseph Banks, after traveling to Tahiti in 1769, returned to England and eventually became the president of the Royal Society. There, through his own patronage and by introducing bright young scientists to other prospective mentors, Banks played a leading role in the development of a network of English and Scottish explorers, biologists, chemists, astronomers, and other scientists -- and kept them in touch with colleagues on the Continent, even during the Napoleonic Wars. The other two major figures are William Herschel, the German-born astronomer with an improbably dedicated sister and an extraordinary gift for building accurate telescopes; and Humphrey Davy, chemist, popular lecturer, and inventor of the gauze safety lamp for use in coal mines. A host of engaging figures round out the story, ranging from balloonists, to poets, to miners, to aristocratic patrons. Joseph Banks in paradise, William Herschel's discovery of Uranus... This book is awesome. Joseph Banks is a primary character in this book, starting with his startling discoveries when journeying with James Cook, and his raunchy interactions with the natives in the Pacific, before casting him in the role of promoter of science and discovery as President of the Royal Society. It focuses on the scientific work in the UK, especially that of William Herschel and his sister Caroline, Humphrey Davey and then also the young guns - Michael Faraday and John Herschel. Their work and lives are described as well as their interaction with the poets and writers of the day -Erasmus Darwin, Percy and Mary Shelly, Keats and others. The age was one where man was looking to find an alternative to God. The edges of the universe were pushed back with bigger and better telescopes, and yet they could not find heaven. The dangerous conditions in coal mining where overcome with the invention of the Davy lamp. Dark was turned into light by harnessing electricity. It laid the foundation for the work of Charles Darwin and the further exploitation of the earth. Oh my goodness! I'm a fast reader and this book took me forever to read (I returned it a week overdue after renewing it once for an additional three weeks) but it was worth every minute. Holmes' exploration of how the sciences began to flourish during the Romantic generation is incredibly interesting and covers everything from astronomy to anthropology, biology to chemistry, and everything in between. At no point was I ever bored by this book and everytime I put it down I looked forward to opening it up again. Holmes has written a detailed series of short biographies of the prominent individuals living in what he calls the "Age of Wonder". It is a period which he fits into the short 75 year span between the "Age of Discovery" and the "Romantic Scientific Discovery" period that follows. His "Age of Wonder" comprises roughly 1750 to 1825, or so. Holmes grandly recounts the history of Joseph Banks' joining the James Cook saling expedition around the world, including the lengthy stopover in Tahiti. Upon Banks' return to London he eventually becomes president of the Royal Society and is the one who guides the scientific community acceptance of William Herschel's discovery of a new planet (Uranus). The Herschel story makes up the second chapter of the book. After those two interesting biographical histories, I lost interest in the midst of the ballooning craze and the chemistry advances by Davy, that followed. I rarely finish a non-fiction book. No matter how fascinating the subject matter, the writing must be exceptionally special to hold my attention. This is such a book. Not since "Undaunted Courage" have I been so swept up. I did not finish. I was not filled with wonder. Though fascinating on Davy, Herschel and Banks, and an admirable attempt to span the "two cultures" of art and science, this book draws too-tenuous parallels between these scientists and their contemporaries. There is much speculation, which feels as though the author is trying too hard to create analogies, when the actual content needs no such augmentation - the examples of Coleridge and Davy make it quite clear that the worlds of poetry and chemistry were not yet separate. This detracts slightly from what is otherwise an excellent book; well researched, readable and covering a fascinating period in the development of western society. The Age of Wonder (2008) is a smart, well-written and well-structured group biography of British scientists from about the 1780s to the 1820s. This 40 year period is best known for Romantic literature but as Holmes shows there was also remarkable science being done and they were often close friends, indeed informing each others works. The main characters are Sir Joseph Banks, the brother-sister astronomers William and Caroline Herschel, and chemist Humphry Davy. There is large cast of supporting characters. Generally I found the book to be mixed. When it good it is very good. The early chapters shine in particular the history of ballooning, Mungo Park's explorations in Africa, and Caroline Herschel's domestic journey from servant to "queen" of the heavens. The later chapters are necessary for a biography but mostly forgettable. What Holme's captures is a sense of discovery, of an immediacy and excitement and most of all humanizing science. They were people with faults and quirks which makes them more approachable and not ivory tower subjects for specialists. This book describes the rise of science, in particular the appearance of the scientist as a separately identifiable job, from the late 18th century through to the middle of the 19th century. This story is told through the lives and relationships of three giants of science: Joseph Banks, William Herschel and Humphrey Davy. Holmes pays particular attention to the interaction between these scientists and the Romantic Movement, asking whether this was in harmony or conflict. The history is exciting. These men did not just extend human knowledge, but opened whole new areas for research and analysis. They adopted the scientific method we understand today, based on observation, theory, experiment and the logical assembly of chains of evidence and proof. Herschel used his extraordinary astronomical observational skills to show the existence of ‘deep space’ and ‘deep time’ raising doubts about the central position of Man in the Universe. Davy practically invented the science of chemistry as we know it today and used its practical application to make real improvements in the lives of miners everywhere. Banks, through the Royal Society, drove science to the heart of governance in Great Britain and provided a key driving element in the expansion of the Empire. These men were not just scientists. Holmes shows their own literary talents, often from unpublished texts, and their friendships with the literary giants of the time – Coleridge, Byron, Keats and others. Their most speculative and poetical scientific ideas could not have been made without this literary movement expressing a strong desire to discover and interact with Nature.